Aromas of spices, smoke, berries and bark follow through to a medium body, medium round tannins and a wonderful finish. Love the finish of this, which gives a hint of walnuts, dark tea and ripe fruit. Very sophisticated. A blend of malbec and cabernet sauvignon. Better in 2019. A joint effort by Les Domaines Barons de Rothschild (Lafite) of France and Nicolas Catena of Argentina. Intense ruby color. 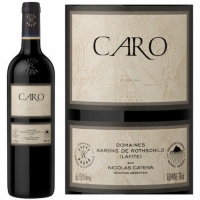 On the nose, aromas of red and black fruits, mingled with hints of mocha and spices. Evolves slowly, revealing layer after layer of elegant fragrances. On the palate, the acidity is refreshing and persistent. Well-balanced tannins contribute to the harmony and smoothness of the palate.